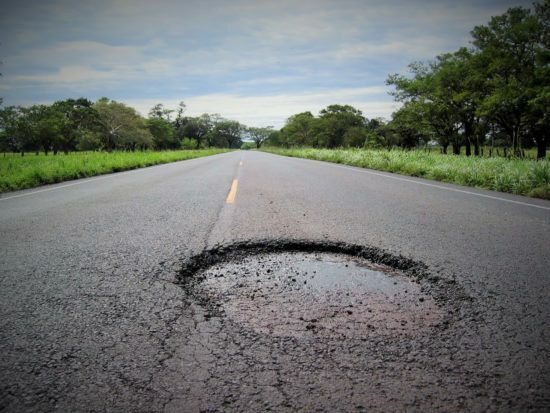 Aged infrastructure and a lack of funding are alleged to cause American roads to fill with potholes, threatening commuters and damaging vehicles. • The vast majority of USA’s highways was built between 1950-1970, and the projected average life cycle of each highway was 50 years. • The American Society of Civil Engineers estimates that fixing deteriorated roads would cost $2.7 trillion. • Each US citizen pays on average almost $400 every year because of damage to vehicles due to potholes. • The overall cost of bad roads to US businesses is estimated to be $240 billion (2016-2022). • The cost of no-intervention today means that failure to spend 1 dollar to repair roads, today, will result in 7 dollars of extra-costs 5 years later, while rebuilding a road from scratch costs 14 times as much as repairs. • One third of approximately 30k yearly traffic fatalities is somehow related to poor pavement conditions. Bike riders are the most threatened. Almost everybody has dealt with road potholes. The above-shown numbers witness that US’ roads need to be improved, but as we all know that’s just a single part of a nation-wide infrastructural problem. On average, almost 50% of our States’ road network is in poor condition, but there are not enough funds to bring forth that great road renewal plan that the country so badly needs. Both federal funding and gas tax revenues are not enough when it comes to repairing our roads. Nevertheless, a solution must be found. Being projected more than 50 years ago, it is no scandal that those technological findings that allow today’s engineers to design better roads were not implemented at the time. Innovative roadway technologies must be therefore identified and properly implemented within future road restoration projects. Specifically, geosynthetics and modern pavement solutions play a fundamental role, reinforcing and stabilizing the underlying soil layers, thus preventing early deterioration, especially in cold and rainy regions. It will be therefore crucial that local communities pay attention when local roads and highways are repaired: geosynthetics are cost-effective, reliable and budget friendly, but the long-term return of the initial investment is priceless, as safer and long lasting roads are in everyone’s interest.